Once upon a time there was a big bad wolf. He had it out for some little piggies. The wolf went over to the pig's house and told them to come out. Those stubborn piggies would not come out of their house no matter what. So the wolf huffed and puffed, and blew the house down. Sometimes your child is like the big bad wolf. They may not be hunting down piggies, but they sure do get excited over candy. 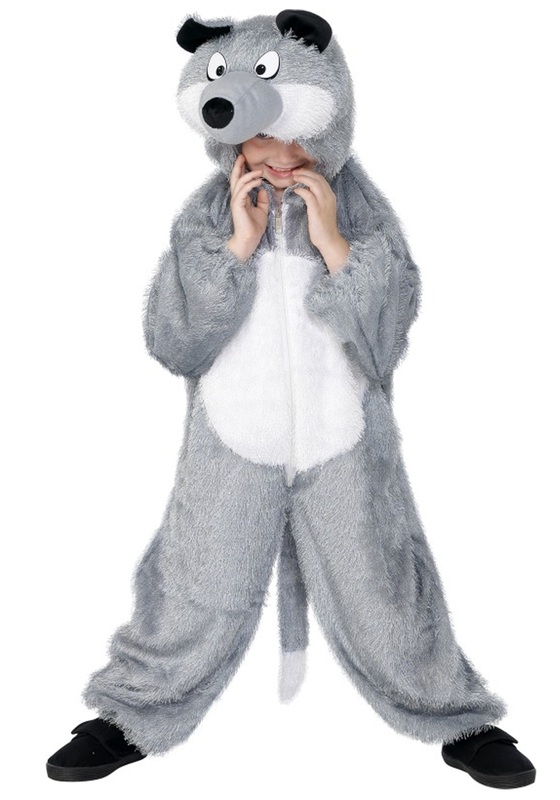 This Halloween your child can bring out their inner wolf and howl at the moon. The beautiful dogs are cunning, clever, and consistently smart just like your kid. Whether they are hunting down prey, or trick-or-treating the wolf is the perfect animal to emulate. Your child will look like the cutest pup in the Child Wolf Costume. No real wolves were harmed in the making of this costume. The 100 percent polyester faux fur will act as the perfect soft coat every wolf deserves. The pale gray hooded jumpsuit has a white belly, and front zipper. The wolf face is on top of a fully-lined hood comfortable for the child to howl all night in. Not to mention every good dog loves to wag its tail, and the tail on this costume Velcros onto the jumpsuit. Get ready for a night full of candy, fun, and blowing little piggies houses down.